After booking accommodations at Anaheim Desert Inn & Suites, begin planning the rest of your Disneyland® vacation today. Our hotel is conveniently located to some of Southern California's most popular sites. 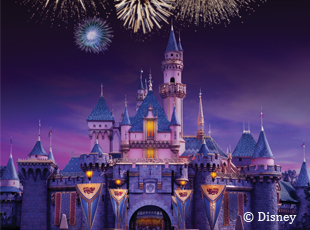 Discover the beginning of the magic at Disneyland® Park in Anaheim, California. As one of the top theme park destinations in the world, Disneyland® allows kids and kids-at-heart to experience the joy and excitement of rides, shows, shopping, and dining with the characters they know and love. 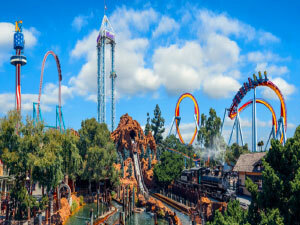 Knott's Berry Farm is a 160 acre Anaheim, California, theme park featuring fast thrill rides, delicious boysenberry pie, a water park, and so much more. In 1933, Buena Park farmer Walter Knott launched Knott's Berry Farm on just 10 acres of leased land. When things got tough during the Depression, Mrs. Knott set up a roadside stand selling pies, preserves, and home-cooked chicken dinners. Lines became so long that Walter decided to create an Old West Ghost Town as a diversion for waiting customers. Today, guests can still enjoy their famous chicken dinners and boysenberry pie. 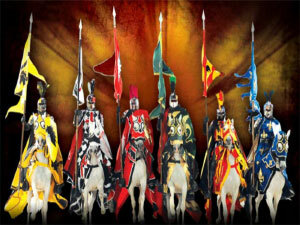 Journey to the time of knights and kings with thrilling shows and medieval-style dining. As you enter the castle, prepare yourself for the excitement of watching brave knights compete in a tournament of jousting, sword fighting, and more as you feast on an 11th century-style banquet of roasted meats, potatoes, and more. 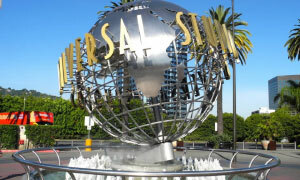 Adventure as your favorite Universal movies come to life at this top Southern California attraction. Create some mischief with the Minions of Despicable Me, or help in the battle over Earth as the Autobots fight the Decepticons in an exciting 3-D adventure. Explore the mysteries of the deep as you learn and play at Sea World San Diego. 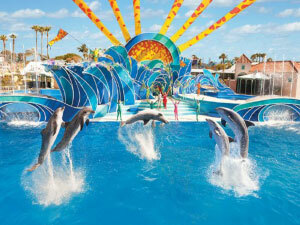 More than just the shows and exhibits that started it all, Sea World also features unique thrill rides and animal interactions that put you face-to-fin with some of their stars. 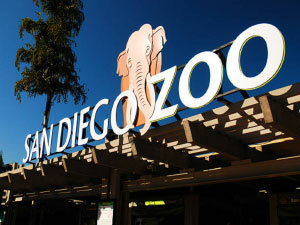 The San Diego Zoo is a 100 acre zoo, located in downtown San Diego known for its lush landscapes and natural animal habitats. This expansive zoo is home to more than 3,600 rare and endangered animals and 6,500 species of plants. Activities include summer camps, guided tours, shows, and a 3-D theater experience. 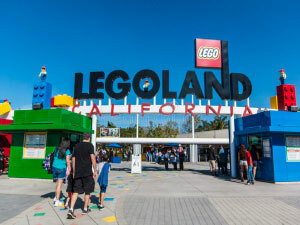 The home of more than 60 exciting rides and attractions at LegoLand. Surround yourself with animated Legos, see famous sculptures recreated with Legos, and see how Legos are created at the Lego Factory. This park offers fun for the entire family. 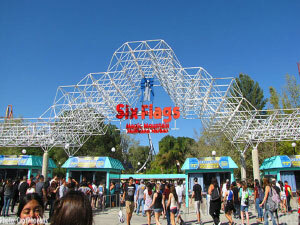 Experience the thrill of excitement when you ride some of the best roller coasters in Southern California. From loops and twists to water coasters to the world's tallest ride, there is something here to please every thrill seeker. There are plenty of rides and events to keep the kids busy, including a meet and greet with Looney Tunes characters or The Justice League. 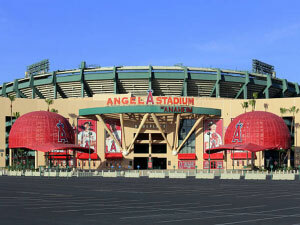 Angels Stadium - 2.9 Miles, 7 min. Angel Stadium of Anaheim, originally known as Anaheim Stadium serves as the home ballpark of the Los Angeles Angels of Major League Baseball (MLB) as well as concerts, motor cross competitions and monster truck events. 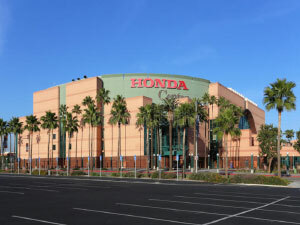 Honda Center - 3.6 Miles, 9 min. Home to a wide array of events, including NHL hockey and live concerts.